Austin Babywearing works to make a positive difference in the lives of children and their caregivers by sharing the practice of babywearing. Our meetings provide attendees the opportunity to try many carriers, receive expert instruction, and get connected with other caregivers in our supportive and inclusive community. After many months of searching, we found a new location for our monthly Lending Library Meeting! We will now be meeting at the Ronald McDonald House Charities of Central Texas on 1315 Barbara Jordan Blvd. Austin, Texas 78723. Meetings will be held on the fourth Saturday of each month (unless otherwise noted) from 10:30 am to 12:30 pm. Please park in the free Dell Children’s Medical Center parking lot (RMHC’s parking lot is small and only accommodates guest families and volunteers). 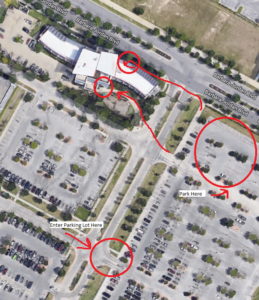 The DMCM parking lot is right across the street from RMHC, and you can come in through either our North or South Entrance – please see the ultra-professional map below. If the doors are locked, buzz the intercom and RMHC will let you in – once inside, take the elevator to the 4th floor, and the Community Room is the only publicly-accessible area up there (so it’s not hard to find!). RMHC is allowing us to use the space in exchange for a donation. ABW makes a monetary donation to RMHC each month and we invite you to make a donation if you would like to from their Wish Lists (this is not a requirement to attend meetings). Join our Facebook Discussion Group to ask questions and connect with other members. Follow our Facebook Page for our latest news and announcements. Email Librarian@AustinBabywearing.org for help with your rental carrier, instructions for laundering, or to arrange to return outside of a meeting. Email Volunteer@AustinBabywearing.org if you are interested in volunteering with us. 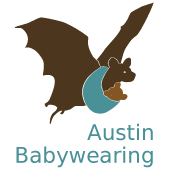 Email info@AustinBabywearing.org with any questions.